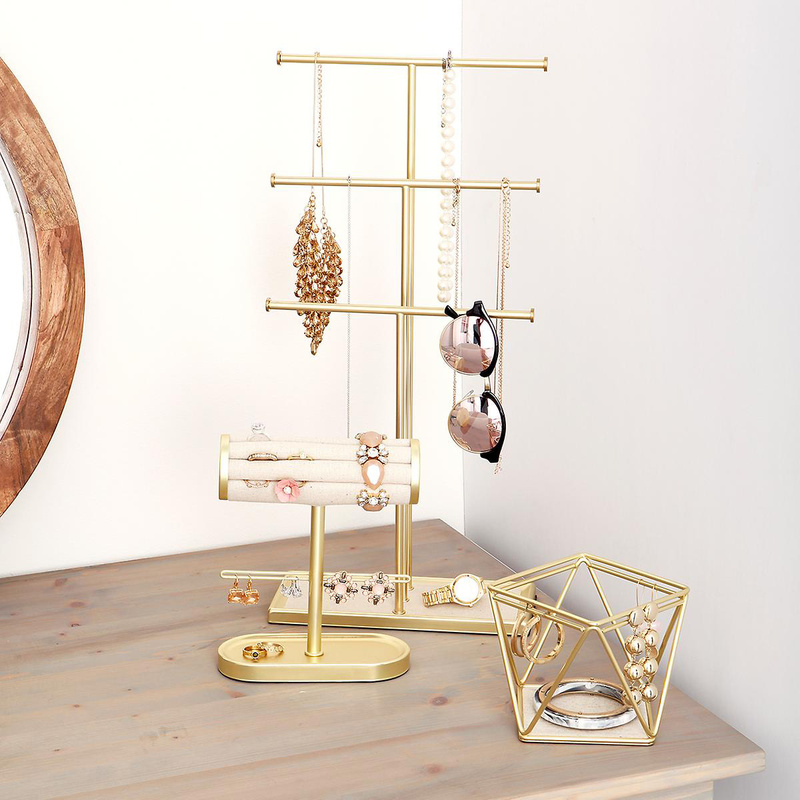 Long necklaces, chunky bracelets, earrings that tend to get lost and rings of all sizes - no wonder displaying and organizing your jewelry collection can be so challenging. 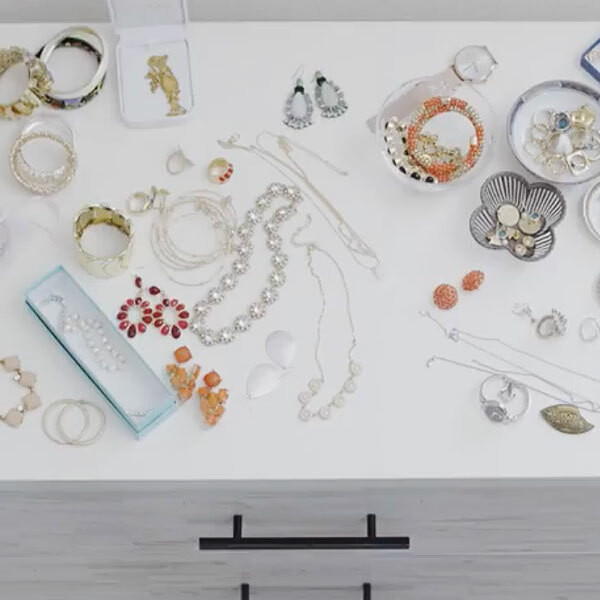 Combine that with having to decide whether you want to organize your jewelry on a countertop, in a drawer or even on a wall, and it's easy to see why the task never gets done. 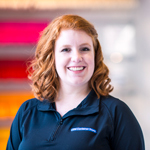 Fortunately, with all the organizers available, it's easier than ever to create your own custom solution. 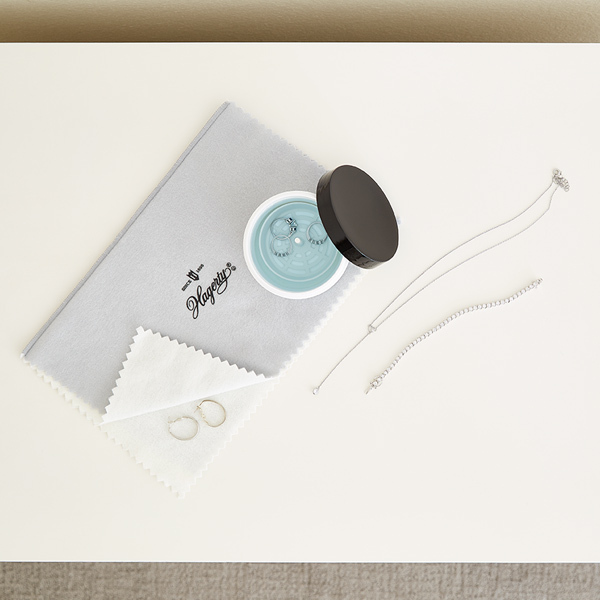 If you've ever hunted for a missing earring, or worn the same jewelry day after day because it's easier than finding the necklace you're looking for, this project is for you. 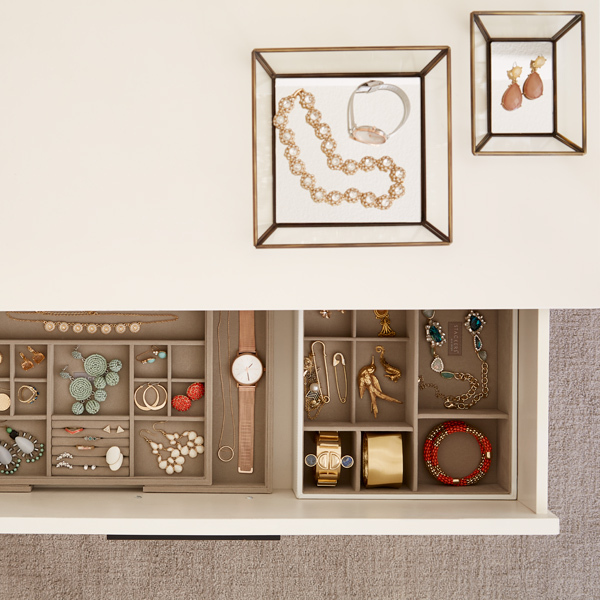 And with all the ways you can organize your jewelry, you're sure to find a system that is perfect for your collection. First gather all your jewelry together in one place and sort into piles. You'll want to separate jewelry by type and by occasion. Be sure to inspect each piece for damage and wear, and set aside items that need to be polished or repaired. This is a great opportunity to get your jewelry in tip-top shape. Take this time to polish tarnished silver or gold pieces. Clean rings and wipe down pearls. Have a broken bracelet clasp or necklace chain? Take it to be repaired. Don't forget to replace missing earring backs. Finally, store occasional pieces in a special jewelry bags design to prevent tarnish. 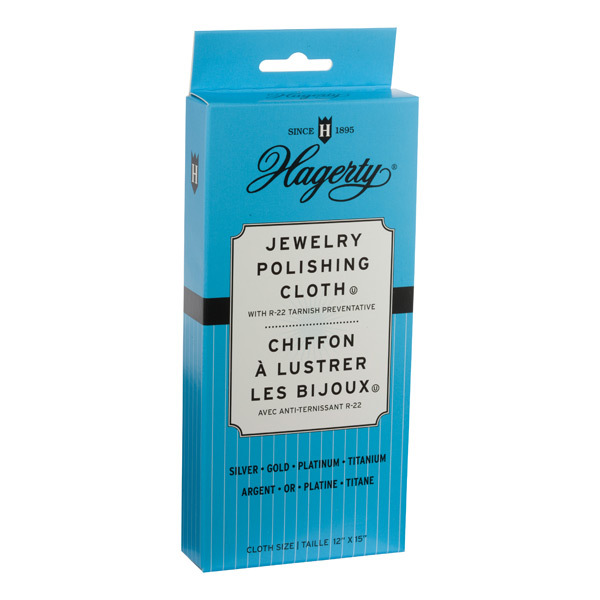 Quick Tip: A jewelry polishing cloth is an easy way to quickly remove tarnish and buff gold, silver and platinum pieces. If you're storing your jewelry on the countertop, you'll want to make use of your vertical space by using stackable jewelry boxes or organizers. 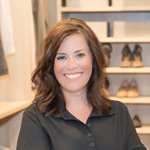 This allows you to create a custom solution. You'll find options in a variety of materials including acrylic, glass, metal and fabric-lined trays and drawers. To keep everything accessible, build your solution by stacking modular organizers with drawers on the bottom. Look for jewelry organizers with trays and inserts to hold rings and divided compartments to keep earrings and broaches separated. Put jewelry you tend to wear more often in the top layer. 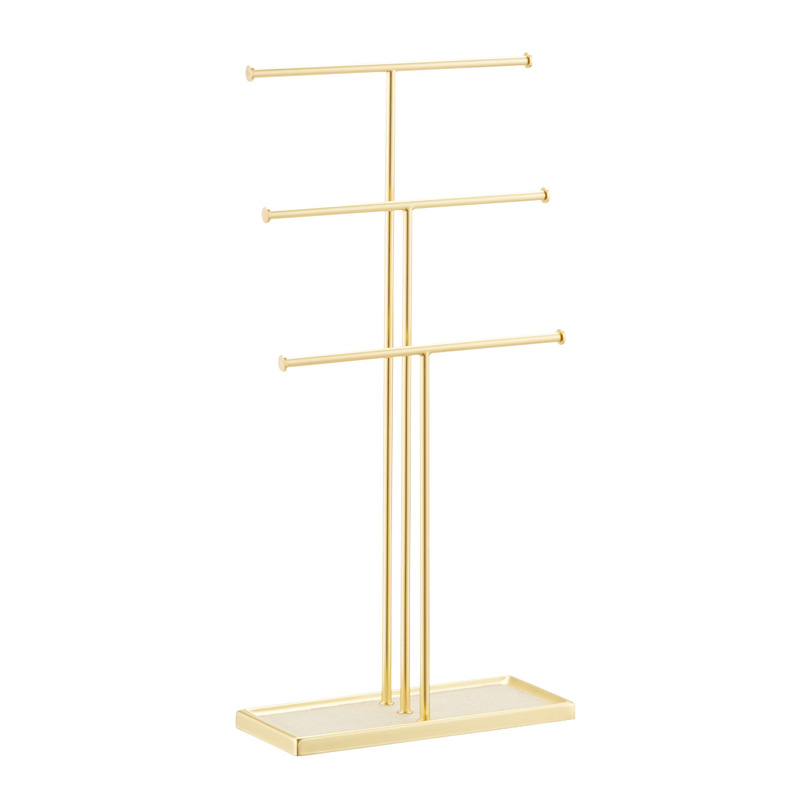 If you have a lot of bracelets, rings, watches or long necklaces, consider using a specialty organizer in addition to the stacking organizers. Many have multiple tiers to make use of vertical space. This is also a good way to keep pieces you wear on a daily basis accessible. If you decide to store your jewelry in your drawers, you have a couple of options to organize your pieces. 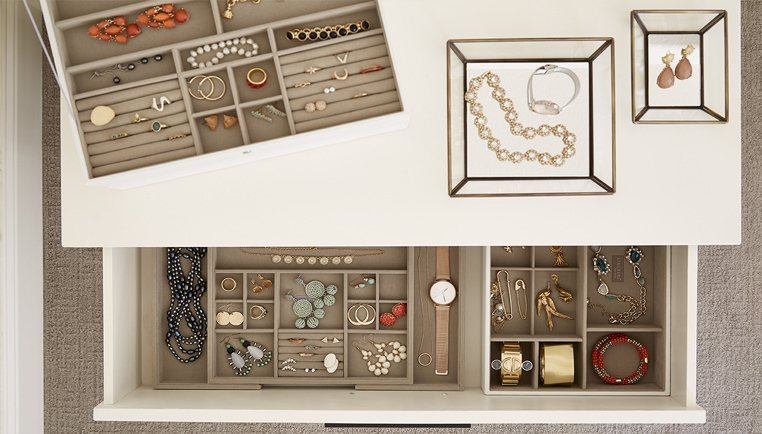 Modular organizers let you build a custom solution based on the pieces of jewelry in your collection. Expandable trays and organizers can be sized to fit your drawer. 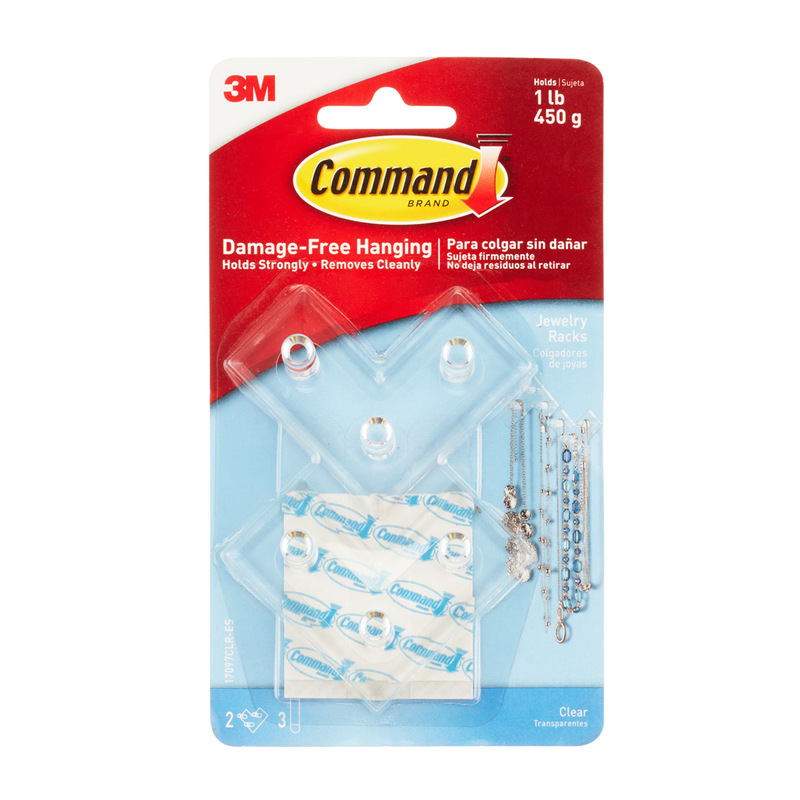 Finally, hanging organizers can be a convenient option for small spaces. 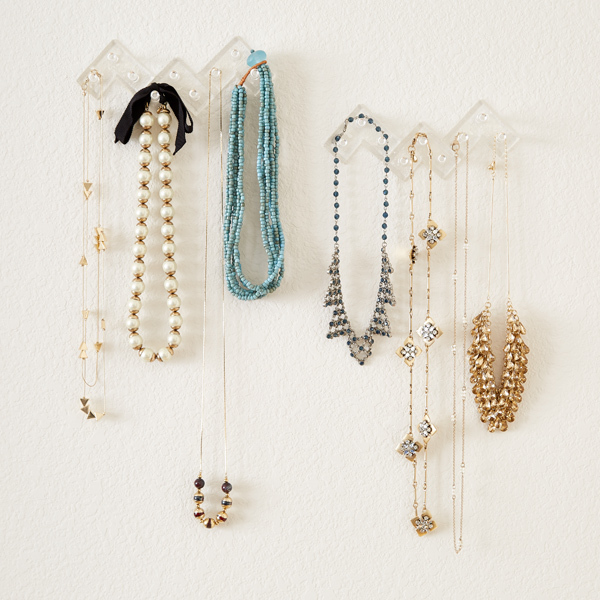 Consider using a hanging jewelry organizer on a closet door or hang it from your closet rod. Or if you have an Elfa Door & Wall Rack, you can hang jewelry on a Utility Board. You can even use your jewelry as art by hanging it on a series of hooks or rack.